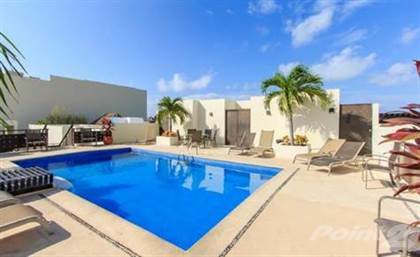 Gorgeous and spacious 2 bedroom 2.5 bath condo at the trendy north end of Playa del Carmen. The Meridian building has 32 condos and is located on First Avenue and Calle 40 Norte, 1.5 blocks from Coco beach and one block from 5th Ave. The famous 'pedestrian' shopping, restaurant and bar street. The area surrounding the condo is quiet, and a short stroll from many good restaurants and shopping. Swimming pool on the rooftop.\r\rThe condo is on the ground floor of the building, and has 2 bedrooms each with its own full bathroom, one with a king bed and a 2nd bedroom with 2 twin beds, an extra half bath in the living area, and an open fully equipped kitchen with custom mahogany cabinets and granite counter tops.\r\rThe building is well managed and has a beautiful rooftop swimming pool, gated with security guards, and onsite reserved parking. This condo that is priced at a steal because the owner is ready to sell. Make great money renting it out to vacationers! Hi, I'd like to find out more information about Meridian. Thanks so much!